Capernaum loosely translates itself as “chaos” in the opening title card. It’s also the best title of the year, it’s got a snappiness to it. It also describes the film that follows perfectly, a messy, tedious and miserable experience, but primarily, Capernaum is chaotic. From the camerawork, meant to invoke a sense of realism, to the plot progression, it’s a film in disarray, confusing misery with authenticity. It’s a work of dire and unpleasant abrasiveness which isn’t supposed to be enjoyable per say, but commonly, other works of this type have competent filmmaking to back it up. To make things worse, the entire progression of pain is filtered through an absurd filter of of a courtroom framing device. In these scenes, we follow twelve year old Zain (a genuine Zain Al Rafeea), who has decided to sue his parents because they gave birth to him. This triggers a series of flashbacks, which makes up the majority of the film. In these flashbacks, follow Zain with his parents (a great Fadi Yousef, and Kawsar Al Haddad), his sister Sahar (Haita ‘Cedra’ Izzam), along with other siblings, and others around him making the way through the harsh climate of Beirut. These opening scenes sour the movie in a long-term way, setting up messy filmmaking, constant chaos, and consistent dire circumstances. The strangest part of all is that parts of this film are supposed to be improvised. Director Nadine Labaki setup different scenes and let certain actors run wild, but it’s odd that she didn’t direct them away from these situations. Every scene places Zain in danger, or constant and wrenching struggle and somehow only gets worse from there. It’s harrowing and genuinely horrific to watch, but I don’t believe it acts as good art. As good as the intentions are, the film isn’t compelling enough. It continues to up the ante in different painful ways, making the feel equally unpleasant and poorly made. 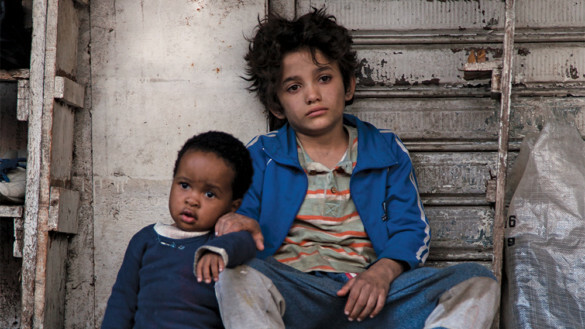 The blunt visuals and queasy yet constant score makes Capernaum feel like a work of docudrama, especially with the casting of non-actors. You could compare this in creation with The Rider, another acclaimed Sony Pictures Classics film from 2018. Where these two differ is Capernaum uses a whack-a-mole hammer to tackle a subject that should have used a paintbrush. Something as genuinely interesting as this deserves a clearer focus, a better directorial style, and a cohesive point. It hammers and hammers towards making a point by giving us a tour of explicit pain and struggle without any subtlety.